The transition is the part between turns, when you are transferring from one set of edges to the other set of edges. The edges have been released from the previous turn and you are going through "skis flat" and on to the new set of edges. The determining factor is how you released the previous turn. In a good transition, you are floating, with the skis carrying minimal weight but still in contact with the snow. In a clean carving transition, we avoid pivoting the skis, which have a tendency to twist and change direction when flat on snow, especially when coiling properly from the previous turn, as the stored coiling tension throughout the body tends to leverage the upper body's inertia and twist the much lighter lower body, boots and skis. We transfer weight not only from edge to edge, but also from ski to ski namely from the old outside ski to the new outside ski. We can try to avoid an abrupt weight transfer, i.e. a "hop" from the old ski to the new ski and focus on a smooth weight transfer, using a lot of relaxation and Flex to release. See Flex to transfer weight. If you feel the back of your boots in transition, you need to pull back harder on the boots - try to feel the shins pressing in the tongues of the boots, that's a sure sign that the boots are as far back under the hips as they can be. 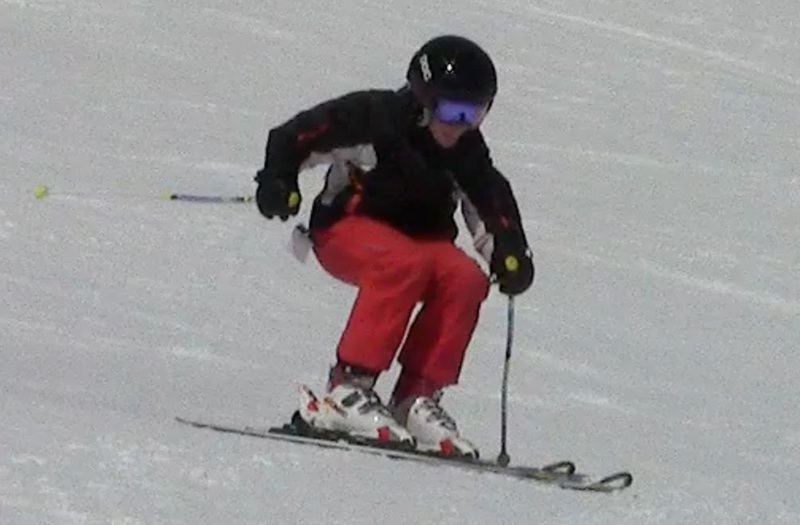 Later, as you extend to the side, that tension will keep them right under the hips, so you can apply pressure wherever you need on the ski (the tips to start the carve) and that's expert-skiing++. If the previous turn was done right and you managed to extract good energy from it and are now floating through transition, everything is perfect and set in motion by the release of the previous turn. If the previous turn was not that great, or the release mis-timed, then you have some work to do to recenter and get the hips ahead of the boots, for the new turn. 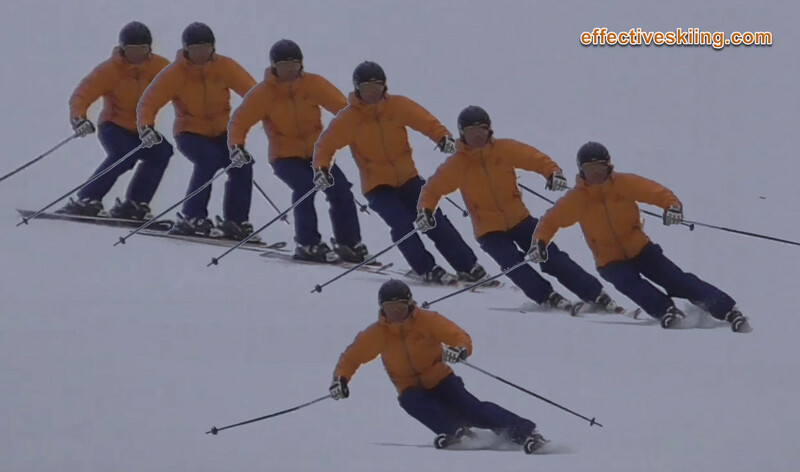 The other thing you will notice on the photo above is coiling in the first few frames, (separation, counter) where the shoulders point more down the hill while the skis transition to the side. This is another sign of expert-skiing and usually more pronounced in shorter turns. In fact, from top to bottom, while the skis turned more than 90 degrees, the shoulders barely turned maybe 20-30 degrees. Member-only content avilable (144 words). Viewed 1240 times ( | Print ) this page.